Shadows to Stardust: New Release: BorderTown Zombie serial. Until this point in my writing career I've only written two short stories dealing with Zombies, both of which appeared in my collection, 9 Dark Tales, that can be found by clicking here. Till Death Do We Part: Focused on a down on his luck, unemployed, middle aged man who kisses his wife goodbye on the morning of the zombie apocalypse. Going back to bed he is awakened later to discover a distressed message from his wife, and a world that has been turned upside down. Throughout the story he receives calls from his wife, answering them only to be greeted by strange sounds he cannot place. She returns home changed. I'm not going to reveal the ending here as I don't want to spoil the story for anyone who may want to read it. The second story was titled Don't Mess With The Pizza Guy, and dealt with a fictional pizza delivery guy named Meat, working in the post apocalyptic world twenty years after the Zombie apocalypse. He had been born during the apocalypse and his mother named him Meat, as that was all he appeared to be given the circumstances. He survived, she didn't. Taken in by the man he called Dad he wound up in the fenced community of Bremo Bluff where a co-genreation had operated since the mid fifties. Those that established Bremo Bluff in the early days understood there was safety in numbers so they welcomed survivors, both good and bad, creating a place called BorderTown for the less desirable members of society. BorderTown would serve as a buffer between Bremo Bluff and the uncivilized world beyond. Twelve years after the awakening, as it came to be called among other things, Meat and three of his friends embark upon an adventure to retrieve several young children who had been taken by a savage band of kids that had infiltrated Bremo Bluff. Their goal is to be scavengers as those who venture beyond the fence in search of supplies are held in the highest regard within the community. Their adventure will be a blend of the coming of age story The Body, mixed with the savagery of The Lord of the Flies. 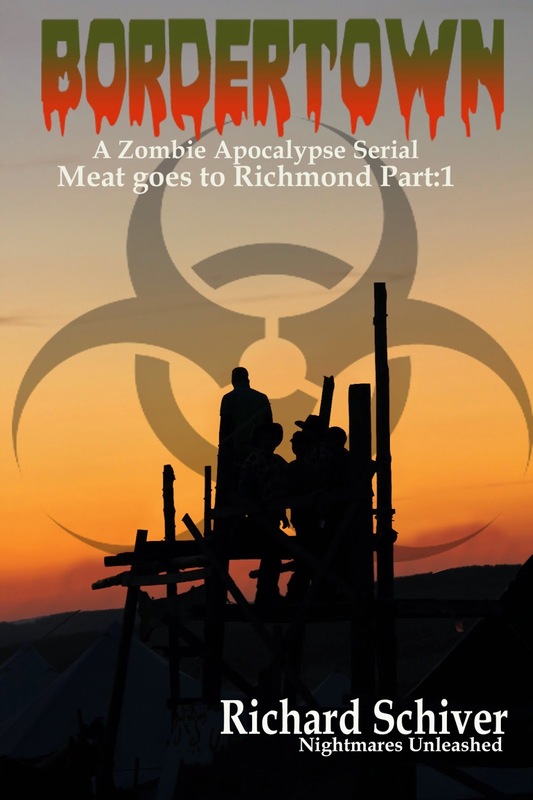 Meat Goes to Richmond Part 1, is the first installment in what will become an ongoing serial. Each installment will be no less than 10,000 words,and priced at $0.99 ea. Part 2 will release near the end of January with part 3 following a month later, at which point I will bundle the three parts into a novella. Armageddon Air Force (no cover available) will find Meat and his band searching for a weapon to counter a coming attack from the south with the first part released at the end of March, and subsequent installments following approximately every thirty days.